*All the color of the acrylic flowers, cotton knots and bell are randomly assorted. *Since the size above is measured by hand, the size of the actual item you received could be slightly different from the size above. Meanwhile, please be reminded that due to lighting effects, monitor's brightness / contrast settings etc, there could be some slight differences in the color tone of the pictures and the actual item. *If you got any questions about this parrot cage toys, welcome to email us whenever you need, and we will try our best to solve it to your complete satisfaction. 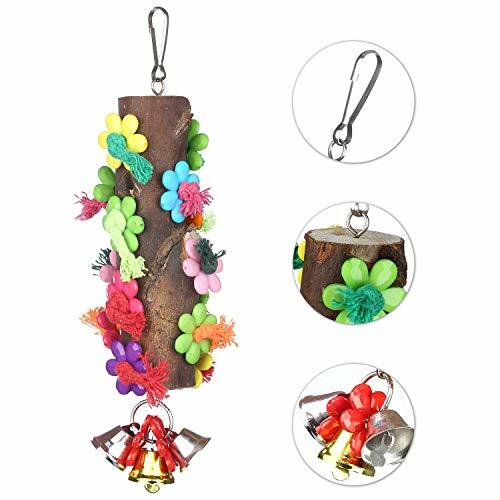 You can install the natural bird chew toys on or out of the cage to fit your bird's desires, it will help the birds to increase exercise, grind nails and beaks, play diverse to keep health while having fun with this parrot toy. Made with 100% pet safe materials: Jusney bird hanging toys is made from the non-toxic and environmental protective and friendly natural wood and dyed with the food grade color, completed with purely handmade which are more bite resistant and durable. Perfect for all small or medium birds, amazon parrot, cockatiel, mini macaws, conures, african gray terminator, so do the other small pets, like hamsters, squirrels, rabbits and so on, it's quite durable and long lasting. Purchasing warranty: Once you purchased on and ONLY on Jusney, we provide a 25 days' return or refund or new free replacement without any question asked. Click "Add to Cart" NOW! If you have any questions about this product by Jusney, contact us by completing and submitting the form below. If you are looking for a specif part number, please include it with your message.